J2 Innovations provides software technology to our partners. We do not supply any hardware, but we do want to make it easy for our partners to run FIN on a wide range of hardware platforms. FIN Framework is available to run on Windows 10, MacOSX and Linux Ubuntu. We recommend at least a 1GHz dual core processor with 1GHz RAM and 1GHz SSD storage. Many customers want to run FIN on a PC in a panel so we recommend the Logic Supply range of fanless industrial PCs and have tested FIN runs well on the CL200 and CL210 versions. On request we can supply, via our distribution partners an image for the CL200 Linux Ubuntu platform. Loading FIN onto the larger memory CL210 which runs Windows is straightforward so no special image is required. For details about the Logic Supply products click here. FIN Framework will also run on other similar embedded PC platforms but these have not been tested. Let us know if you have a particular requirement. 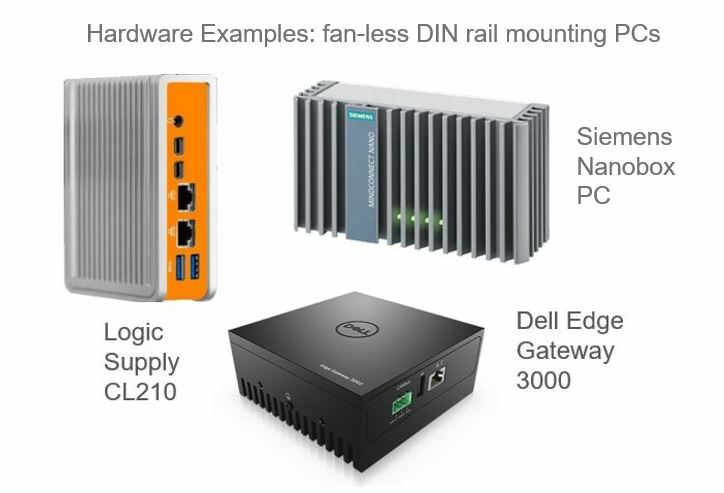 Our OEM partners usually have their own existing hardware platforms. As these are frequently lower spec microprocessors with less memory than PC level platforms, we offer a service to assist OEMs to port FIN to their platform(s). The platform must have a microprocessor and RAM capable of running a Linux OS. If you would like to discuss your specific hardware platform to explore if it is compatible with FIN Framework, then please get in touch with us.